Several irrigation solutions are used to accomplish different tasks for root canal system disinfection. Zehnder9 has described the ideal irrigating solution as being systemically nontoxic, safe on periodontal tissues, nonallergenic, having broad spectrum antimicrobial activity, and being capable of dissolving pulp tissue, inactivating endotoxins, and removing the smear layer (or preventing its formation). Three of the most common irrigants used are NaOCl, ethylenediaminetetraacetic acid (EDTA), and chlorhexidine (CHX). Each offers different properties, advantages and disadvantages for endodontic irrigation. Considered the gold standard in irrigation solutions, NaOCl is the irrigant of choice among endodontists10 due to several properties. Two advantages include the ability to dissolve pulp tissue and kill bacteria. Bacteria use pulpal tissue as a nutrient source, so it is important that NaOCl is able to dissolve both vital11 and necrotic12 pulp tissue. This alone helps eliminate a nutriment source for bacterial reproduction. This bactericidal agent has a direct killing effect on bacteria.13 The mechanisms of action include saponification, neutralization of amino acids, and chloramination.14 These mechanisms either directly alter the bacterial cell wall or interfere with cellular processes. In addition, NaOCl’s high pH of >11 leads to disruption of enzymatic activity. Other advantages of NaOCl include removal of the organic portion of the smear layer created by the mechanical instrumentation of dentin18 and acting as a lubricant in the canal.19,20 Smear layer removal will expose dentinal tubules that can harbor bacteria, thus allowing access for improved elimination of the bacterial load. Lubrication in the canal facilitates navigation of the canal space with the goals of reaching working length and establishing patency. FIGURES 1A and 1B. 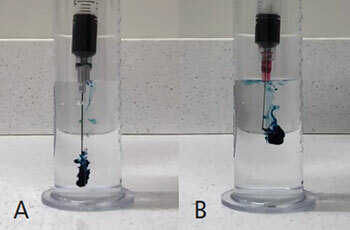 An open-ended, 20-gauge irrigation needle expressing dye forcefully in an apical direction (A) compared to a side-vented, 28-gauge irrigation needle expressing dye in a lateral direction, with minimal apical involvement (B). The third most commonly used irrigant among endodontists,10 CHX is a bisbiguanide antiseptic agent with bactericidal capabilities. It is commonly available in 0.12% and 2% solutions, but the 2% solution is used for endodontic irrigation. The antimicrobial mechanism of action results from the positively charged CHX. This allows CHX to be attracted to the negatively charged phosopholipids in bacterial cell walls. The resulting interaction between the two results in rupture of the wall, creating disruption in the osmotic equilibrium. The consequence is cell lysis and death. Another advantage of CHX — and one NaOCl does not possess — is its sustained action, or substantivity. This irrigant has the ability to bind to dentin with a prolonged release, resulting in antimicrobial activity that can last for months.31 Other advantages over NaOCl include low toxicity and lack of strong odor. mixing chlorhexidine and sodium hypochlorite. More than the irrigant itself is involved in effective chemical canal disinfection, as several factors — such as concentration, volume, time, temperature, and activation of the irrigant — play a role. Concentration has a direct correlation to tissue dissolution and antimicrobial effectiveness. Higher concentrations allow for more rapid tissue dissolution35,36 and increased efficacy as an antimicrobial.37 The majority of endodontists use full-strength NaOCl to take advantage of these properties.10 Historically, this was a 5.25% solution, but now solutions of 6% and above are available. The third factor is time. While concentration and volume are important for keeping a high amount of free chlorine, time is needed for the free chlorine to be effective for chloramination.14 One in vitro study found that 40 minutes was most effective in eliminating Enterococcus faecalis from dentin.38 When performing endodontic therapy, the canals and chamber should be full of NaOCl throughout instrumentation and cone fitting. Dry the canals only when ready to place sealer in the canal. This optimizes NaOCl contact time. Finally, activation of NaOCl via ultrasonics (termed passive ultrasonic irrigation or PUI) can be used to enhance cleaning of the root canal system.41 The mechanism is acoustic streaming and cavitation. Acoustic streaming is defined as the circulation of fluid and hydrodynamic shear forces that occur around a vibrating object. Cavitation is the formation of submicroscopic voids in a fluid medium by shearing forces; these voids implode, resulting in shock waves in the medium. It should be noted that ultrasonic tips or files should not be used around root curvatures because the metal tips can ledge the canal. Also, even though PUI can enhance cleaning of root canal systems, it has not been shown in randomized controlled trials to create significantly better outcomes than standard syringe irrigation.42 In addition to PUI, lasers can be used to activate endodontic irrigants, although the supporting evidence is limited. Obturation is the other phase of root canal therapy. While clinicians can choose from a multitude of obturation techniques, no modality is superior to another in terms of outcomes.43 This is because in the absence of bacteria, healing of apical periodontitis occurs independently from the quality of obturation.44 In fact, outcomes appear to be unaffected by canals that are obturated or unobturated.45 Unfortunately, quality of root canal treatment is still determined based on the radiographic appearance of the obturation. However, this does not necessarily correlate with the quality of root canal disinfection, which is a better predictor of outcomes. Ultimately, the practitioner’s attention to detail and methodology will enhance successful and satisfying endodontic care. Successful endodontic outcomes rely on removing or reducing the bacterial load in the canal system through chemomechanical preparation. Several irrigation solutions are used to accomplish different tasks for root canal system disinfection; these include sodium hypochlorite, ethylenediaminetetraacetic acid and chlorhexidine. More than the irrigant itself is involved in effective chemical canal disinfection, as several factors — such as concentration, volume, time, temperature, and activation of the irrigant — play significant roles. Kakehashi S, Stanley HR, Fitzgerald RJ. The effects of surgical exposures of dental pulps in germ-free and conventional laboratory rats. Oral Surg Oral Med Oral Pathol. 1965;20:340–349. Sundqvist G. Bacteriological studies of necrotic dental pulps. Dissertation. University of Umea, Umea; 1976. Möller AJ, Fabricius L, Dahlén G, Ohman AE, Heyden G. Influence on periapical tissues of indigenous oral bacteria and necrotic pulp tissue in monkeys. Scand J Dent Res. 1981;89:475–484. Siqueira J Jr, Rôças IN. Clinical implications and microbiology of bacterial persistence after treatment procedures. J Endod. 2008;34:1291–1301.e3. Busanello FH, Petridis X, So MV, Dijkstra RJ, Sharma PK, van der Sluis LW. Chemical biofilm removal capacity of endodontic irrigants as a function of biofilm structure: optical coherence tomography, confocal microscopy and viscoelasticity determination as integrated assessment tools. Int Endod J. 2019;52:461–474. Pullen R. Innovations in endodontic cleaning and disinfection. Decisions in Dentistry. 2018;4(4):37–42. Byström A, Sundqvist G. Bacteriologic evaluation of the efficacy of mechanical root canal instrumentation in endodontic therapy. Scand J Dent Res. 1981;89:321–328. Byström A, Sundqvist G. Bacteriologic evaluation of the effect of 0.5 percent sodium hypochlorite in endodontic therapy. Oral Surg Oral Med Oral Pathol. 1983;55:307–312. Zehnder M. Root canal irrigants. J Endod. 2006;32:389–398. Dutner J, Mines P, Anderson A. Irrigation trends among American Association of Endodontists members: a web-based survey. J Endod. 2012;38:37–40. Rosenfeld EF, James GA, Burch BS. Vital pulp tissue response to sodium hypochlorite. J Endod. 1978;4:140–146. Svec TA, Harrison JW. Chemomechanical removal of pulpal and dentinal debris with sodium hypochlorite and hydrogen peroxide vs normal saline solution. J Endod. 1977;3:49–53. Waltimo T, Trope M, Haapasalo M, Ørstavik D. Clinical efficacy of treatment procedures in endodontic infection control and one year follow-up of periapical healing. J Endod. 2005;31:863–866. Estrela C, Estrela CR, Barbin EL, Spanó JC, Marchesan MA, Pécora JD. Mechanism of action of sodium hypochlorite. Braz Dent J. 2002;13:113–117. Nair PN. Endodontic biofilm, technology and pulpal regenerative therapy: where do we go from here? Int Endod J. 2014;47:1003–1011. Costerton JW, Lewandowski Z, Caldwell DE, Korber DR, Lappin-Scott HM. Microbial biofilms. Annu Rev Microbiol. 1995;49:711–745. Clegg MS, Vertucci FJ, Walker C, Belanger M, Britto LR. The effect of exposure to irrigant solutions on apical dentin biofilms in vitro. J Endod. 2006;32:434–437. Baumgartner JC, Mader CL. A scanning electron microscopic evaluation of four root canal irrigation regimens. J Endod. 1987;13:147–157. Boessler C, Peters OA, Zehnder M. Impact of lubricant parameters on rotary instrument torque and force. J Endod. 2007;33:280–283. Chandler N, Chellappa D. Lubrication during root canal treatment. Aust Endod J. 2018. Pashley EL, Birdsong NL, Bowman K, Pashley DH. Cytotoxic effects of NaOCl on vital tissue. J Endod. 1985;11:525–528. Siqueira J Jr., Rôças IN, Favieri A, Lima KC. Chemomechanical reduction of the bacterial population in the root canal after instrumentation and irrigation with 1%, 2.5%, and 5.25% sodium hypochlorite. J Endod. 2000;26:331–334. Seidberg BH, Schilder H. An evaluation of EDTA in endodontics. Oral Surg Oral Med Oral Pathol. 1974;37:609–620. Drake DR, Wiemann AH, Rivera EM, Walton RE. Bacterial retention in canal walls in vitro: effect of smear layer. J Endod. 1994;20:78–82. Morago A, Ruiz-Linares M, Ferrer-Luque CM, et al. Dentine tubule disinfection by different irrigation protocols. Microsc Res Tech. 2019. Epub ahead of print. Foster KH, Kulild JC, Weller RN. Effect of smear layer removal on the diffusion of calcium hydroxide through radicular dentin. J Endod. 1993;19:136–140. Kokkas AB, Boutsioukis A, Vassiliadis LP, Stavrianos CK. The influence of the smear layer on dentinal tubule penetration depth by three different root canal sealers: an in vitro study. J Endod. 2004;30:100–102. Crumpton BJ, Goodell GG, McClanahan SB. Effects on smear layer and debris removal with varying volumes of 17% REDTA after rotary instrumentation. J Endod. 2005;31:536–568. Grawehr M, Sener B, Waltimo T, Zehnder M. Interactions of ethylenediamine tetraacetic acid with sodium hypochlorite in aqueous solutions. Int Endod J. 2003;36:411–417. Zehnder M, Schmidlin P, Sener B, Waltimo T. Chelation in root canal therapy reconsidered. J Endod. 2005;31:817–820. Rosenthal S, Spangberg L, Safavi K. Chlorhexidine substantivity in root canal dentin. Oral Surg Oral Med Oral Pathol Oral Radiol Endod. 2004;98:488–492. Basrani BR, Manek S, Sodhi RN, Fillery E, Manzur A. Interaction between sodium hypochlorite and chlorhexidine gluconate. J Endod. 2007;33:966–969. Orhan EO, Irmak O, Hur D, Yaman BC, Karabucak B. Does para-chloroaniline really form after mixing sodium hypochlorite and chlorhexidine? J Endod. 2016;42:455–459. Rasimick BJ, Nekich M, Hladek MM, Musikant BL, Deutsch AS. Interaction between chlorhexidine digluconate and EDTA. J Endod. 2008;34:1521–1523. Hand RE, Smith ML, Harrison JW. Analysis of the effect of dilution on the necrotic tissue dissolution property of sodium hypochlorite. J Endod. 1978;4:60–64. 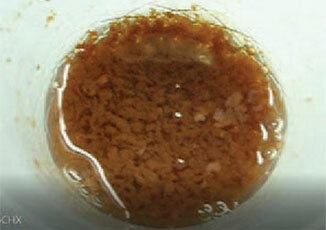 Gordon TM, Damato D, Christner P. Solvent effect of various dilutions of sodium hypochlorite on vital and necrotic tissue. J Endod. 1981;7:466–469. Harrison JW, Hand RE. The effect of dilution and organic matter on the anti-bacterial property of 5.25% sodium hypochlorite. J Endod. 1981;7:128–132. Retamozo B, Shabahang S, Johnson N, Aprecio RM, Torabinejad M. Minimum contact time and concentration of sodium hypochlorite required to eliminate Enterococcus faecalis. J Endod. 2010;36:520–523. Sirtes G, Waltimo T, Schaetzle M, Zehnder M. The effects of temperature on sodium hypochlorite short-term stability, pulp dissolution capacity, and antimicrobial efficacy. J Endod. 2005;31:669–671. Cunningham WT, Joseph SW. Effect of temperature on the bactericidal action of sodium hypochlorite endodontic irrigant. Oral Surg Oral Med Oral Pathol. 1980;50:569–571. Archer R, Reader A, Nist R, Beck M, Meyers WJ. An in vivo evaluation of the efficacy of ultrasound after step-back preparation in mandibular molars. J Endod. 1992;18:549–552. Liang Y-H, Jiang L-M, Jiang L, et al. Radiographic healing after a root canal treatment performed in single-rooted teeth with and without ultrasonic activation of the irrigant: a randomized controlled trial. J Endod. 2013;39:1218–1225. Peng L, Ye L, Tan H, Zhou X. Outcome of root canal obturation by warm gutta-percha versus cold lateral condensation: a meta-analysis. J Endod. 2007;33:106–109. Fabricius L, Dahlén G, Sundqvist G, Happonen RP, Möller AJ. Influence of residual bacteria on periapical tissue healing after chemomechanical treatment and root filling of experimentally infected monkey teeth. Eur J Oral Sci. 2006;114:278–285. Sabeti MA, Nekofar M, Motahhary P, Ghandi M, Simon JH. Healing of apical periodontitis after endodontic treatment with and without obturation in dogs. J Endod. 2006;32:628–633. From Decisions in Dentistry. April 2019;5(4):18–21. Patrick J. Battista, DDS, Dip ABE, is a clinical assistant professor and director of predoctoral endodontics in the Department of Periodontics and Endodontics at the University at Buffalo School of Dental Medicine. A diplomate of the American Board of Endodontics and a member of the American College of Diplomates, he practices endodontics in Williamsville, New York. Eugene A. Pantera Jr., DDS, MS, is a clinical associate professor emeritus at the University at Buffalo, where he served as director of the Division of Endodontics and the advanced program in endodontics. A national and international lecturer, he is a fellow of the Academy of General Dentistry, American College of Dentists and the International College of Dentists. He can be reached at epantera@buffalo.edu.